All of the state office jobs were open in this election on November 6th. Some Republicans currently in office were changing offices and the Democrats seemed to work hard in their campaigns. But in the end the GOP retained all the top offices in Ohio. If you can’t even win one state office with such a toxic person like Trump as President and a GOP who are just lap dogs to the guy not to mention corrupt in the Ohio Statehouse, then Democrats need to nuke their place and start over from scratch. This entry was posted in Politics, Progressive and tagged 2018 Election, Ohio, Ohio Democratic party, Ohio Governor on November 9, 2018 by Doug. I don’t declare myself for any political party as I find the organized parties – mainly the GOP and Democrats – actually hurt democracy through all the various election laws they have enacted in order to protect their hold on the offices of government. However, reading my blog, one should see where my political stances are. I just avoid official parties. I do read Democratic leaning blogs including Ohio’s Buckeye State Blog. A recent dust up over an interview with a potential candidate for the soon to be open US Senate seat just reaffirms my bias against parties. 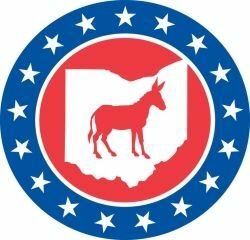 It seems one of the admins and “front pagers” at BSB interviewed Lt Governor Lee Fisher and asked about a pledge issued by Ohio Democratic Party chair Chris Redfern that none of the people who wanted the soon-to-be vacant Senate seat, ask for their ODP endorsement for the primary. The problem was the interviewer gave the Fisher people a chance to review the video and asked that question and answer about the endorsement pledge be removed. This led to incriminations that the interviewer was “in the tank” for Fisher by even considering letting his people suggest edits. Words like “objective” and “journalism” were thrown around. There were a bantering of nasty comments made by each side and in the end the interviewer quit the blog and one of the people upset about the incident seem to also quit. This is a perfect example why a pledge against getting a pre-primary endorsement is a good idea. Even in a political party you have people with different views and who support different people in the party. If the ODP endorses a single candidate for an office before the members of the party have a chance to decided who they want then you have the same kind of nasty dust up the Fisher interview caused. You also get some who take their ball and go home because they didn’t get their way etc…. The sad part is the BSB seems to have this kind of thing happen more often than it should. There have been 3 administrators of the blog in 3 years and with each change has come a change in content focus and some behind the scenes dust up with hurt feelings and people quitting. Why am I writing about it? One reason is because I think the rules forcing an endorsement before the primary is plain stupid. If a person gets the endorsement then it makes it very hard for any other potential candidate to have a chance to win the primary because an endorsement forces the party to steer resources to the endorsed candidate. Some people only support endorsed candidates. Think of it this way. If the national Democratic party had a stupid rule like the Ohio party we may or may not be discussing or hearing about President Hillary Clinton’s plans to deal with the economic melt down. When President Obama started his campaign most Democrats assumed Hillary was going to be their candidate for the national election and she might have gotten the endorsement if one was forced to be made before the primaries. Why a state party wants to make the primary moot is beyond me. Another reason to write about the issue at BSB is to lament the almost narcissistic obsession with the operation of a blog. If I were in charge the issue would never be public and I wouldn’t have allowed the kiss off posts by the offended parties. It was more an internal dispute and the fact that it was on the front page when other issues are more important is a bit amateurish. And any one not in the loop would be confused about what was going on. The person who was most offended by the interview and called the interviewer “in the tank” for Fisher has had some strong views both for and against certain Democratic candidates and office holders. In fact he called for Dennis Kucinich to be voted out of Congress on the front page of BSB for what appeared to be personal reasons – he just didn’t like him running for President all the time? Of course I’m not looking for total objectivity at BSB since it supports Ohio Democrats but the admins should decide if they are going to let candidates to control the info posted about them and at least that hasn’t happened. The interview in question was not initially posted on BSB, which was the interviewer’s prerogative since it wasn’t for BSB, and the admin who is now left to administer the blog alone said it won’t happen ever. The blog should be a place to talk about and debate the merits of potential candidates and then when one is picked in the primary, then it should support that person. So in conclusion, the issue of a party pre-primary endorsement is a big deal but the dust up at BSB over an interview including a question about the pledge is not and should have been dealt with in private. This entry was posted in Politics and tagged Buckeye State Blog, Democrats, Ohio, Ohio Democratic party on March 14, 2009 by Doug.